Are you looking for a particular color? a certain type of material? a feature like tie-on or non-slip? Regardless of what you need, chair cushions can easily make your dining room look its best and fit the occasion or your lifestyle needs. Dining-room chair cushions are the most effective way to improve the style or theme of your kitchen or formal dining-room. Give your eating area a facelift when the seasons change, for holidays, for that special occasion. Dining room chair cushions that tie on add a bit of class and style with just a little extra material. 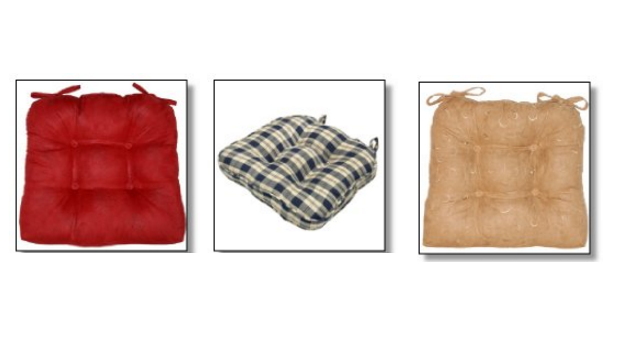 Of course, they also serve the purpose of keeping the cushion in place, no matter how much moving or wiggling you do. And the fact that they are held in place by the tie-on strings instead of a non-slip material means they can also be flipped over to hide a spot or to help extend the life of the material. Non-slip or gripper-style dining room chair cushions are great for those highly varnished wooden chairs where cushions tend to spend more time on the floor than in the chair seat. Although they can be easily moved or adjusted, they stay in place when sitting down or getting up. Reversible dining room chair cushions are the answer to every homeowner’s prayers! Got a stain? Flip it over! Got a hole? Flip it over! It’s like getting two cushions for the price of one! Since you won’t be able to have any non-slip material on one side, be sure to get the tie-on ones so they stay in place better. Cushions with ruffles or skirts can bring a country atmosphere to your kitchen dining room with the use of checks and more casual designs. But a classy damask material would also add class to a more formal dining room. Most dining room chair cushions come with instructions to just “spot clean” but there are machine washable ones to be found. Since washing will of course make them fade somewhat, wash them all at the same time so that they fade and age at the same rate. 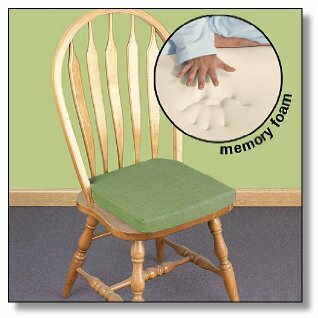 Memory foam dining room chair cushions are probably the most comfortable seats you can find. By instantly contouring to your buttocks, spine and thighs, they provide the support and comfort needed to not only correct your posture but to make it possible to sit for long periods of time without hurting. And the non-slip backing makes sure they don’t move around too much … even if you do! When trying to match the theme of your kitchen, chair pads may be the way to go. Although they are not as comfy as cushions, there are lots more options for chair pad covers which will let you stay with a specific theme. Outdoor dining chair cushions are great but need to be of a certain kind of material in order to stand up to the exposure of being outside. This same material though is great for indoor dining tables … especially if there are lots of little ones around who might be spill-prone or just rougher on the cushions. Does your dining room need a facelift? New cushion covers may be the easy answer to adding a feeling of “new” to your dining room!